Babies need so many things. I love to shop, so at first registering was a welcomed challenge. But even I got overwhelmed with all of the options out there. I could dedicate a post on each section or product for weeks, but instead decided to consolidate and write this book of a post. I hope that moms-to-be find it helpful or if you are shopping for a friend get some ideas. What kind of mommy blogger would I be without adding my unsolicited registry advice? Where to start? I copied a friend's registry and then began swapping, adding and removing products after researching and determining what was the best fit with my lifestyle. Some items came from lengthy mommy blog investigating, while others were added to my list simply because I saw them on top registry pick lists and I called it a day. While it's only been 10 weeks, I will say that I have put most of my registry to good use and am happy with my choices. For background, I live in a two bedroom apartment with limited storage space. That said, it's hard to believe this was my attempt to keep things simple. I feature the gender neutral version of most products - you can be sure that if it was available in pink or gray that is what I have. Also, if you happen to be into an animal theme you're in luck... I gravitate toward those giraffes and elephants! Once we started to plan for a family I began to notice strollers and check out the brands. UPPAbaby everywhere! I opted for the UPPAbaby Cruz because of the compact frame. Many people go with the Vista model because it includes a bassinet and can be converted to a double stroller down the line. I decided I'll get a double stroller when I need it. I also considered the Baby Jogger City Mini ZIP, which is a great more affordable option. It folds up easily and is also compact. As for the car seat, I went with the UPPAbaby Mesa to make things easily compatible with the stroller. Ted was able to install the base in our car without any issues. I feel inclined to share my research findings for those in the market... the Chicco KeyFit 30 ranks high in safety and is very popular. The nuna PIPA is another favorite and a couple pounds lighter than most. You can add both to the UPPAbaby frames with an adapter. Even though Alexa hates to be swaddled, I use the muslin blankets to keep her warm, shade her from the sun and as a nursing cover. I always have one with me. I originally registered for a different type of carrier, but when I saw it in the store it looked big and bulky. I opted for the basic BABYBJÖRN carrier and it has worked out well so far for both me and Ted. I also have a Solly Baby wrap. For a diaper bag, I use a standard tote bag with the Skip Hop Chevron bags inside. Read more about that here. I had originally planned for Alexa to sleep in the Rock 'N Play next to our bed, but when we brought her home from the hospital she was so tiny it didn't feel right to keep her in there at night. We then bought the Graco Travel Lite Crib as a bassinet. I chose this because it was compact for our bedroom and also suitable for road trips. After a few weeks we used the Rock 'N Play. If we weren't planning to travel in the first few months I would have probably gotten the HALO Bassinet. When she is older we will transition to a BABYBJÖRN Travel Crib for getaways. When you are up in the middle of the night to change diapers, a zip-up onesie is so much easier than cute little snaps to change. Your husband will especially appreciate the zip when he is helping out. I bought several from Carter's and the Carter's Just One You line for Target. For the first couple of weeks I used the Angelcare Tub on the kitchen counter next to the sink and now we have placed it in the big tub. I learned about this $7 bath sponge from A. Liz Adventures to place on top of the tub and also use it directly in the sink when we travel (I purchased a spare so it was dry when packing). The critter towels from Pottery Barn Kids are adorable. You can also get them personalized with name or initials. I love Alexa wrapped up in her bunny towel! Babies can easily absorb chemicals through their skin, which is why I use Beautycounter's line free of unsafe ingredients. If I had to pick one of my favorite things for Alexa, it would be the Baby Soothing Oil. We use it after baths to keep her skin extra soft and she loves when I apply it. The set makes a great shower gift. I went with the Keekaroo Peanut changing pad over the more popular fabric style because you can just wipe off a mess. I am not crazy about the way it looks, but it gets the job done. I have been placing a towel or liner over it, although it doesn't need it. For diapers I had a couple packs of newborn and size 1 to start. I didn't stock up since I didn't know what size she would be. As it turns out, she wore the newborn size until 8 weeks. At this point, I don't have a strong preference on diapers or wipes. I continue to try different brands and I'm sure when the messes get bigger will have stronger opinions. It's not an option, but a necessity to have this diaper pail. You can use standard trash bags and your nursery won't stink. I'm partial to Beautycounter's Baby Balm, but my close second choice is the Honest Organic Healing Balm. At first I thought a separate drying rack was unnecessary, but now I can't imagine being without a dedicated space for bottles, pacifiers and breast pump parts. There is a reason why the Boon drying racks are so popular. My bottle research pointed to the glass Dr. Brown's despite all of the separate parts they include. 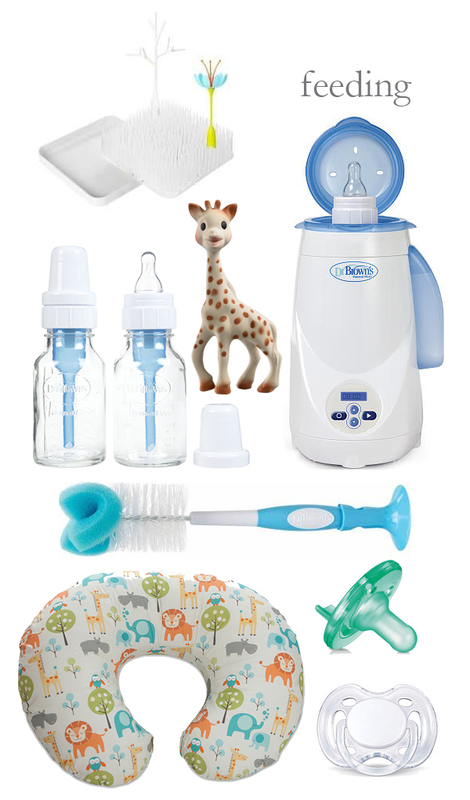 I use those as well as Philips Avent (I got it in a sample pack and love how cute and little it is). These burp clothes are absolutely nothing special to look at, but are very absorbent. I have a happy spitter on my hands, so keep one in every room and bag. Since I am nursing, I can't weigh in on how many bottles you would need if you are formula feeding or how much formula to buy. We started giving Alexa a bottle of pumped milk once a day when she was 2 weeks old. Having a few 4 oz. bottles has been enough and eventually I will buy the 8 oz. size when needed. I figure before stocking up I should determine if she or I have a preference. 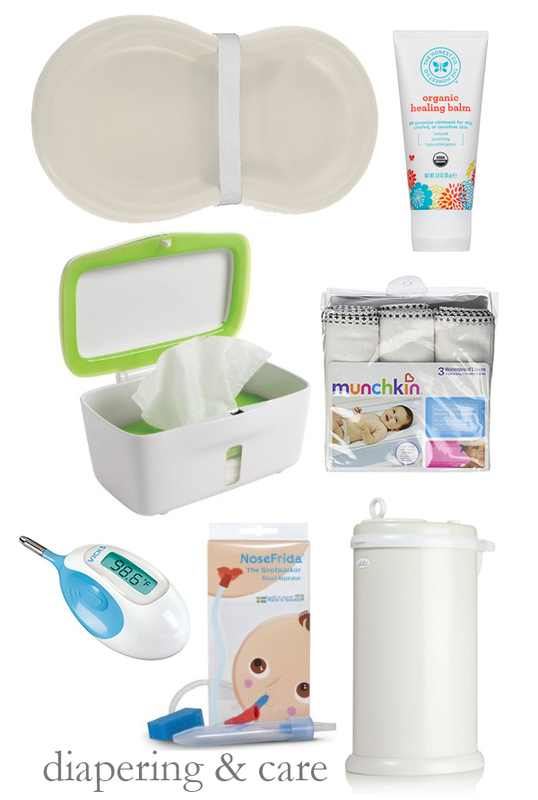 I added these nursing items on my registry after my shower and purchased myself. I kid you not, as I was working on this post an expecting friend texted me to confirm the gel pads I told her to get and ask about creams. Put them in the fridge for extra relief that first week. As for creams, you will likely be given lanolin at the hospital. Both that and the Lansinoh cream I purchased ahead of time were thick and waxy, I had a hard time getting it off my fingers. My lactation consultant prescribed Mupriocin 2% ointment, which I use the most. Ask for a prescription! 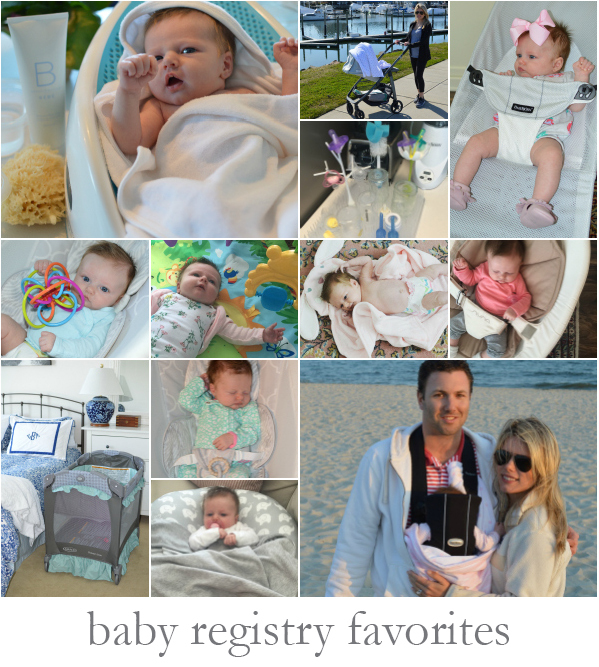 The Boppy Lounger has been by far one of my most used items. I bring it all over the apartment and Alexa loves to snooze in it. When I visit my parents I take it along and wish I had saved the zip-up plastic bag it came in. I also love the nuna LEAF Baby Seat that I received as a gift and included on this earlier post. One of the notable things that I did not to get was an electric swing or bouncer for newborns like the mamaRoo. Instead, I have sat and bounced her myself on an exercise ball. This is going to be hard to believe, but I actually didn't buy much clothing for Alexa before she was born. I received most clothing as gifts and have purchased since she was born. More on that in another post. Wow, you've made it this far. I'm running out of steam but of course you need to furnish and decorate your nursery! Alexa's nursery is basically her changing room because she has yet to sleep there. However, that did not stop me from having it complete before her arrival. Here is a list of the essentials. Finally, here are items I did not register or purchase yet but you may want to include. I can be indecisive so I registered where I could easily bring things back to return or exchange. I am a little crazy and save the receipts for everything and most of the packaging until I know it's something that works and I will keep. For example, Alexa was not into wearable swaddles and she impressively broke out of them within five minutes. Thankfully I had kept the gift receipts and packaging for several I received so was able to exchange them for something else. Consider where it is easy for family and friends to purchase items and save on shipping. Target offers free shipping over $25 and many people have Amazon Prime. Also, what retailer offers the best price or discount on your "big ticket" items like stroller and furniture? I used The Bump to sync my three registries to one link for my shower invite. Buy Buy Baby offers a 10% registry completion discount that has very few exclusions, unlike their other coupons. They have a wide selection, great exclusives and always have coupons. I registered for a few items including towels and decor. 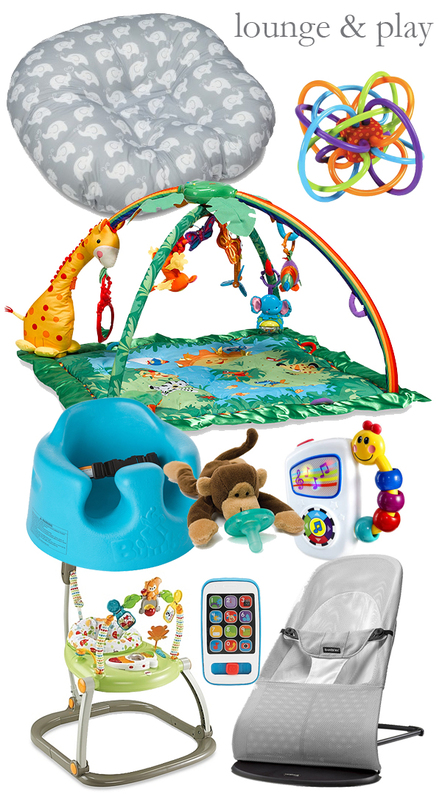 Babies "R" Us, Giggle, Land of Nod, Amazon, Nordstrom, Walmart and Babylist. Moms, I would love for you to add your advice in the comments section to help readers! Where did you register? What am I missing? What are your favorites? This is such a great round up! I'm due tomorrow and have so many of these same products ready to go. I wish I would have heard about the Keekaroo Peanut before, it seems so much easier + cleaner than a regular changing pad! I am glad you shared this, should my journey with IVF work I will definitely be referring to this!